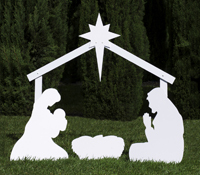 We all often hear the question, “What is the true meaning of Christmas?” One of the simplest and best ways to contemplate the holiday is by viewing a creche display. It is difficult not to be moved by the humble and yet extraordinary circumstances of the night Jesus was born. Artists have represented the Holy Family and the manger in many unique ways over the millennia, and the best ones powerfully capture the love and the beauty of Christmas. If you are looking for a new and meaningful way to celebrate Christmas this year, you may want to consider visiting a crèche exhibit. Here are some of our favorites to consider during the holiday season. The Abbey of Regina Laudis displays a lavish 18th century Nativity thought to have been created for the coronation of Victor Amadeus II, King of Sardinia, in 1720. 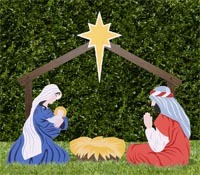 The creche was donated to the Abbey in 1949 by philanthropist Loretta Hines Howard. A similar nativity set she gave to the Metropolitan Museum of Art is the centerpiece of the museum’s Medieval Galleries each Christmas. 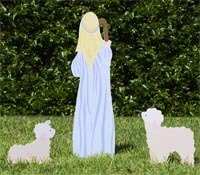 Another oppportunity to view an nativity at the Abbey is the Lauren Ford Crèche, which during the Christmas season is located in a small shed near the Lower Abbey Chapel. This rustic New England-themed creche was created by Connecticut artist Lauren Ford. The Tucson Museum of Art presents El Nacimiento (the creche) on display in La Casa Cordova, an historic old house in what was once the walled presidio area of the city. The large, colorful diorama, created by Mexican American folk artist Maria Luisa Tena, depicts Mexican street market scenes, Old Testament scenes and the Holy Family. From November through January, the Upper Room Christian Art Museum exhibits “The Night of the Child,” a collection of more than 130 nativity sets of all shapes, sizes and materials and representing nearly 40 different cultures. Each December, the College of New Rochelle presents the Kate Canty Creche Collection, which was donated by Jim and Eileen Canty in the name of their daughter. The diverse collection features creches made from diverse materials, including straw and metal, wood and clay, glass and precious gems, beads and feathers, flowers and seashells, fabric and canvas and recycled materials. The Loyola University Museum of Art’s annual holiday exhibition is “Art and Faith of the Crèche: The Collection of James and Emilia Govan.” On a rotating basis each year, the exhibit features about 100 of the more than 500 nativity sets from 100-plus countries that comprise the collection. James Govan continues to collect crèches and has written the book, Art of the Crèche: Nativities from Around the World, which is available in the Museum gift shop or on Amazon. The Glencairn Museum, located in the castle-like former home of Raymond and Mildred Pitcairn, offers its annual “Christmas in the Castle” tours and other seasonal activities. The museum’s permanent collection features nativity art, including paintings, manuscripts, sculptures and stained glass, dating to the medieval period. In 2017, the museum is featuring a magnificent Neapolitan presepio from the collection of Elizabeth Anne Evans of Bucks County, Pa. The large, detailed creche, with pieces Evans collected over a period of 30 years, is on loan from the Samuel S. Fleisher Art Memorial in South Philadelphia. 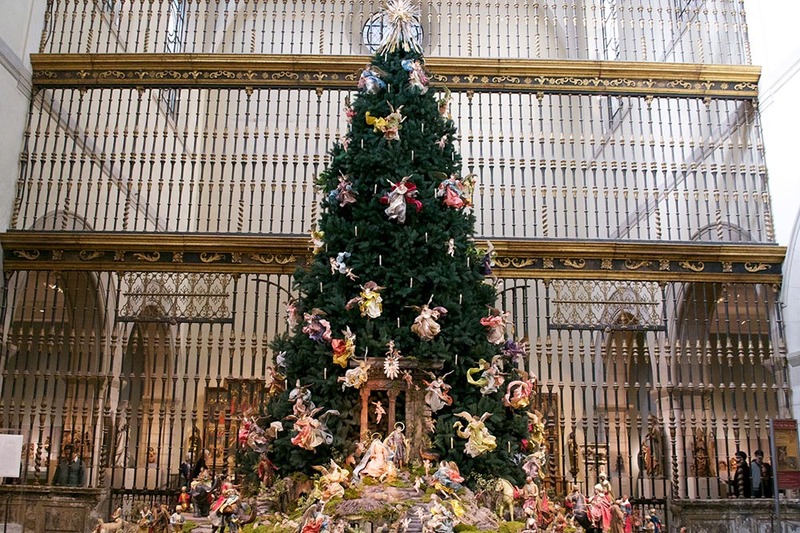 The Metropolitan Museum of Art has a longstanding tradition of presenting an18th-century Neapolitan crèche along with its Christmas tree in the Museum’s Medieval Sculpture Hall. Christmas music and special lighting add to special holiday display. At the base of a 20-foot blue spruce are 71 people and 50 animals representing a traditional 18th-century Italian village. The beautiful and detailed presepio also includes Roman ruins and a working Italian fountain. 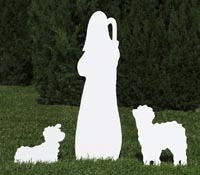 The figures, each a work of art on its own, range from six to 20 inches in height. Notre Dame’s McGrath Institute for Church Life hosts an International Crèche Display that is open to the public during the Christmas season. The exhibit features 33 visual representations from about 20 different countries exhibited at multiple locations throughout campus. Self-guided tour information is available. More than 600 volunteers over the course of five days create The Christmas Crèche Exhibit in Palo Alto, Calif. In 2016, the exhibit, which is free to the public, drew 10,000 visitors from the U.S. and from six other countries. 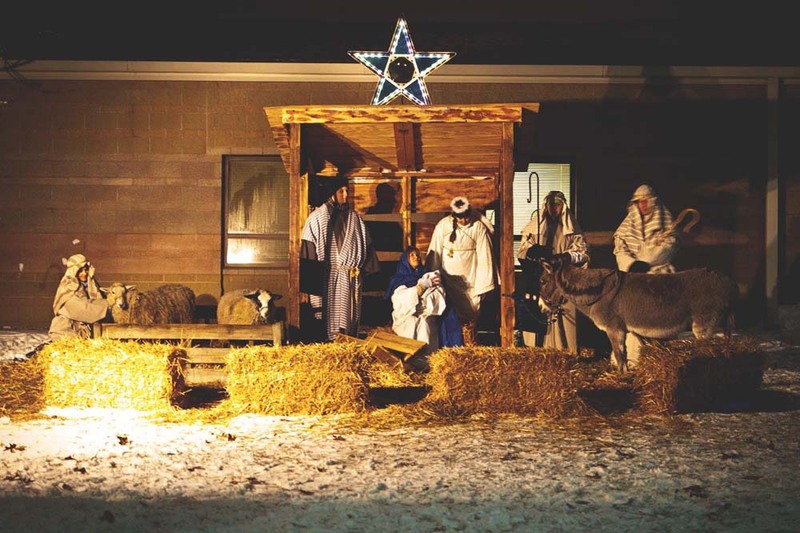 What nativity exhibits do you enjoy visiting each year? Let us know, and we will add them to our list. Posted in Christmas, Guides, Nativity Sets on October 16, 2017 and tagged America, art of the nativity, Christmas decorations, collections, presepio, vintage.